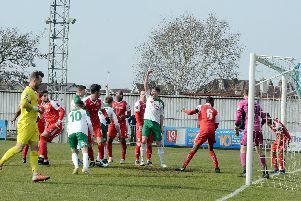 Bognor Regis Town manager Jack Pearce enjoyed his experience in England’s World Cup quarter-final win. Pearce, who is on the FA National Game Board, travelled to Samara for England’s 2-0 win and will fly out to Moscow for the Three Lions’ semi-final against Croatia. If Gareth Southgate’s men reach the final on Sunday, then Pearce will be invited to Moscow’s Luzhniki Stadium with the FA. About Saturday’s game, Pearce said: “It was really enjoyable. I wouldn’t say it was a great game of football. I thought both teams looked very nervous for the first 20-25 minutes. We then settled better than them and I thought for the rest of the game, we were the better side and had chances. “A great first goal, the header, took that ever so well. We then had a couple of opportunities, with Sterling, which he unfortunately didn’t do as well as one would hope, which meant that they were still in the game. “On the two occasions, where they created chances, you wouldn’t be surprised if they scored. The keeper made some excellent saves which considering the fact he hadn’t really been involved much means his concentration powers were ever so good. There were important stages in the game because if they equalised on both occasions even though we were the better side, goals change attitudes, change games so we’ve got to thank the keeper for that because he didn’t have much to do but at vital times he was excellent. At the end of the day, we’ve got through, we’re in a semi-final and it’s great for the country. Pearce was impressed with the $320 million Samara Arena, which is the home of FC Krylia Sovetov, who were promoted into the Russian top tier last season. The stadium played home to four group games, a round of 16 game between Brazil and Mexico, and England’s quarter final.